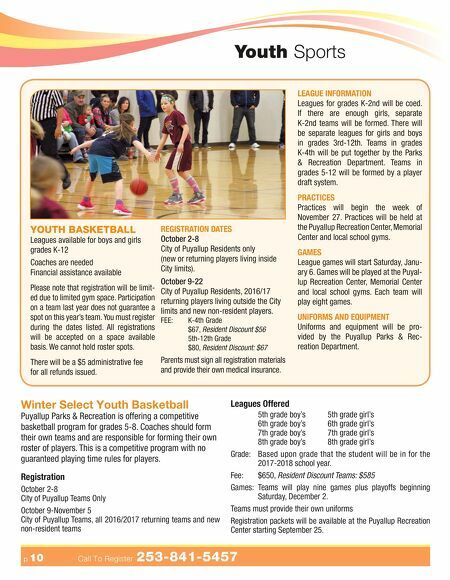 p 10 Call To Register 253-841-5457 Youth Sports Winter Select Youth Basketball Puyallup Parks & Recreation is offering a competitive basketball program for grades 5-8. Coaches should form their own teams and are responsible for forming their own roster of players. This is a competitive program with no guaranteed playing time rules for players. Registration October 2-8 City of Puyallup Teams Only October 9-November 5 City of Puyallup Teams, all 2016/2017 returning teams and new non-resident teams Leagues Offered 5th grade boy's 5th grade girl's 6th grade boy's 6th grade girl's 7th grade boy's 7th grade girl's 8th grade boy's 8th grade girl's Grade: Based upon grade that the student will be in for the 2017-2018 school year. Fee: $650, Resident Discount Teams: $585 Games: Teams will play nine games plus playoffs beginning Saturday, December 2. Teams must provide their own uniforms Registration packets will be available at the Puyallup Recreation Center starting September 25. YOUTH BASKETBALL Leagues available for boys and girls grades K-12 Coaches are needed Financial assistance available Please note that registration will be limit- ed due to limited gym space. Participation on a team last year does not guarantee a spot on this year's team. You must register during the dates listed. All registrations will be accepted on a space available basis. We cannot hold roster spots. There will be a $5 administrative fee for all refunds issued. REGISTRATION DATES October 2-8 City of Puyallup Residents only (new or returning players living inside City limits). October 9-22 City of Puyallup Residents, 2016/17 returning players living outside the City limits and new non-resident players. FEE: K-4th Grade $67, Resident Discount $56 5th-12th Grade $80, Resident Discount: $67 Parents must sign all registration materials and provide their own medical insurance. LEAGUE INFORMATION Leagues for grades K-2nd will be coed. If there are enough girls, separate K-2nd teams will be formed. There will be separate leagues for girls and boys in grades 3rd-12th. Teams in grades K-4th will be put together by the Parks & Recreation Department. Teams in grades 5-12 will be formed by a player draft system. PRACTICES Practices will begin the week of November 27. 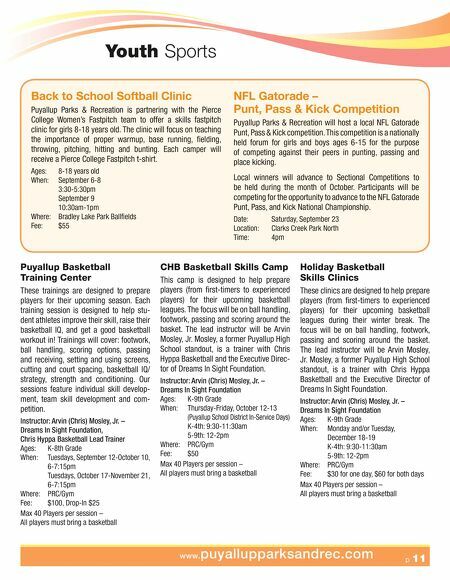 Practices will be held at the Puyallup Recreation Center, Memorial Center and local school gyms. GAMES League games will start Saturday, Janu- ary 6. Games will be played at the Puyal- lup Recreation Center, Memorial Center and local school gyms. Each team will play eight games. UNIFORMS AND EQUIPMENT Uniforms and equipment will be pro- vided by the Puyallup Parks & Rec- reation Department.